The Pomeranian is believed to have descended from the Wolf-Spitz type dogs that migrated to Pomerania from the north of Russia and Siberia. It shares common ancestry with other Arctic breeds such as the Samoyed and Keeshond. These early Spitz-type dogs were used as guard and sledge animals. At this stage of development, the breed weighed up to 14kg. The smallest puppies from any litters were often kept as companions and later these smaller Spitz dogs were bred together in an effort to further reduce the size. 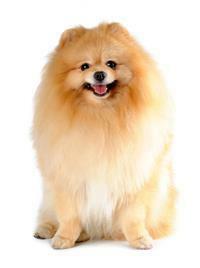 Pomeranians were established as a breed in the 18th century after they attracted the interest of the English monarchy. Owing to its diminutive size and high energy levels, the Pomeranian is not recommended for families with young children. These little dogs are best suited to flat dwellers who are prepared to exercise them on a regular basis. Owing to their high intelligence and loyalty, Poms also make excellent companions for the elderly.